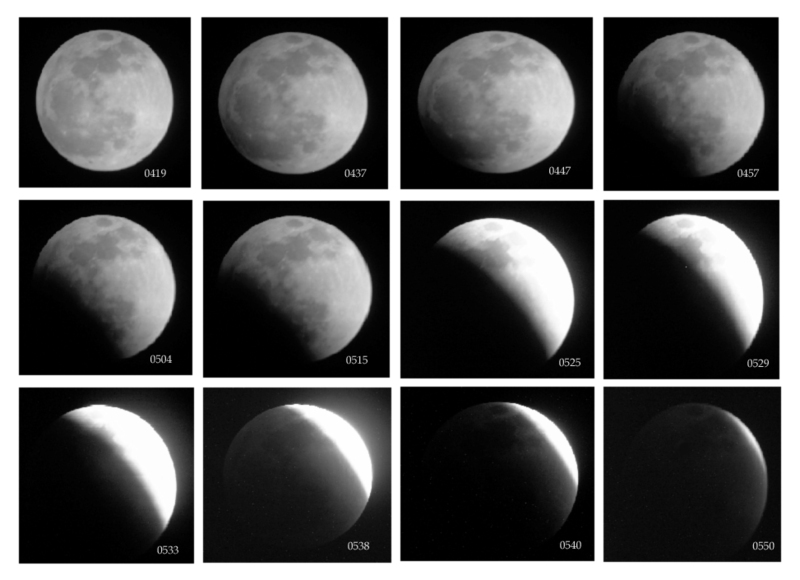 A photographic montage of images I captured of the Lunar Eclipse of August 28, 2007 using a 4.5” f/8 Grampus/ Cosmos equatorial mounted Newtonian Reflector in conjunction with a home-built afocal camera adapter and DC-T50 Gateway 5.25 Mega Pixel digital camera. Click the above image for an enlarged view! At round 3:32 AM EDT, I abruptly woke up from a slumber hoping I had not missed the main event, the total Lunar Eclipse of August 28th 2007. I already had my 4.5” f/8 Grampus/ Cosmos Newtonian reflector setup and acclimating on the covered patio at the south end of my home all set to go. There was no way I was going to missed this special astronomical rarity. To photograph this rare astronomical phenomenon through this instrument, I will use a pre-assembled unit comprised of a Gateway DCT-50 5.25 mega pixel point-and-shot digital camera), TeleVue 40mm Plossl eyepiece, and homemade DCA (digital camera adapter). As a second means of recording the eclipse, I used two Nikon cameras with telephoto lenses mounted on tripods. The first was a Nikon FE-2 film SLR with 200mm Nikon telephoto lens and aperture setting of f/5.6 using an exposure range of 1/250 to 2 seconds. This combination was use to create six multiple exposures images on two separate frames of film throughout the course of the event. The second setup incorporated a Nikon N2020 film SLR with Sigma 300mm telephoto lens using the same aperture and exposure settings as the FE-2, but I took individual frames of the eclipse with one image per frame. The images and other specifics will be posted later in this report once the film has been developed. A photo of my equipment and setup can be seen below. Here is a photo of the equipment I used to photograph the Total Lunar Eclipse as taken on the morning of August 28, 2007 at 4:54 AM EDT. From left to right is my 4.5” Newtonian, Nikon FE-2 film camera, and Nikon N2020 film camera. Click above image to enlarge! This is a photo of the equipment I used from the rear with me facing the west-southwest. In the upper left hand corner you can see the moon in the beginning stages of eclipse. This image was taken at 5:12 AM EDT from my backyard in Riverview, FL. Click above image to enlarge! It was approximately 3:45 AM EDT when I called my colleague Gary “Bam” Barabino of Waggaman, LA by phone to awaken him to prepare for the morning’s “once in a blue moon” event, the Total Lunar Eclipse of August 28th 2007. It was a bit early, but it gave him more time to setup his equipment to prepare for the festivities. As I have already provided my equipment overview on the first page of this synopsis, Gary’s setup was a bit different. Gary chose to photograph the eclipse using film only. The combination he used incorporated his 8” f/5 hybridized Konus Newtonian reflector with 2” 2x ED Barlow in conjunction with his Minolta X370 film SLR. The instruments were interfaced by means of a T-Ring/ Universal Camera Adapter using the Prime Focus method, which the primary mirror in his telescopes basically amounted to a 1016mm telephoto lens. I hope to add some of his images to this article at a later date. After setting up our equipment in the moisture-laden air of our southern locales, I noted that Gary and I were both experiencing very similar weather conditions. Here in Riverview, FL, the sky was clear with a slight haze. The temperature had to be in the lower to mid 80’s, with a humidity of around 80 percent. Dew was clinging to everything. And as you can see in the photos on the previous page, the tiny droplets on the surface of the grass reflected back giving the appearance of frost. To keep my equipment from becoming drenched with dew, I draped terrycloth towels over the critical components of the telescope, and completely off the cameras. By events end, the towels were nearly saturated, but the effort paid off in keeping the moisture contained and off the optics. There was also hardly any wind or breeze, which allowed the mosquitoes to get there fill. Gary Barabino and I performed a joint over the phone coverage of the event. The full moon was in the constellation Aquarius. It was about 4:00 AM EDT when I noticed the first effects of penumbral shadow. The moon dimmed very slightly as it traversed its face. But at around 4:35 AM EDT, Gary noticed the first effects of the umbra on the moons surface. At this point, after already taking a photo of the full moon, we captured our first shot of the eclipse. It was hard to contain our anxiety as the shadow made contact. From that point on, we prayed that our weather conditions (both locales reporting clear skies at the time) would hold. As I scrambled from “Camera 1” to” Camera 2” to “Telescope” and back to “Camera 1”, the whole time I was hoping that I would not screw up the images. But unfortunately, after the fact, I discovered I did not focus my telescope well enough to get the sharpest image possible in the DCT-50 Gateway digital camera. Nevertheless, it was well enough to capture the main emphasis, the earth’s shadow. Just can’t wait to see my film images. My observing session ended at around 06:13 AM EDT with my last shots at totality. I did not include all of the digital exposures in the montage, because they were so dark. Gary reported he could have observed on past totality to witness more of the second half of the eclipse as the moon’s limb once again emerged from earth’s shadow. Bam observed from the U3 boundary track, while I from the U2 track. This enabled Gary to see more of the eclipse than I. The moon was practically still in totality as the moon set from my locale. Though the entire Lunar Eclipse event was not visible from here in Riverview, FL, it was assuredly one of the best I had ever covered in such detail, surpassing even the Lunar Eclipse of 1982. Gary described it as being “The Best” he has ever seen. The red copper tone of the umbra as depicted on the moons surface was the deepest color Gary can recall. The moon's projected path, as it traversed through the earth’s shadow during the 08/28/2007 Total Lunar Eclipse. This chart displays the geocentric zones depicted the areas of visibility of the eclipse. We were in zones U2 and U3.